The beginning is always here. Right now I am sitting on one of the grey bucket chairs in my office – the chair that faces the window. I’m looking out onto a strip of lawn and a bird feeder which is swaying in the cold November wind. The garden drops away steeply and a low ivy-covered wall is a swathe of the Severn valley, today pale with mist. Bredon Hill is in the far distance, and between me and it there are houses and a church steeple and trees and fields. Later the town’s street lights will start coming on one by one and will ornament the darkness with gold. I heard some advice once about what to do when you receive very bad news, like the unexpected death of someone close to you. It was suggested that after finishing the terrible conversation you go and do exactly what it was you were about to do. Maybe you put the phone down and finish hanging out the laundry, or continue writing the email and send it off. I don’t know how this works in practice as I haven’t needed to try it out yet, but I imagine that it has the effect of stitching you back into the world, at a time when everything is threatening to dissolve or blow into pieces. Here – I can pick up this damp sock and hang it up. Here – I can shake the creases out of this pair of trousers. These are the things that I still know and can do and these are the things that need to be done. This is how life goes on. Wherever we are and whatever is happening, we can always return to the material world. We can return to the objects around us, and to our bodies. We can bring our attention to the sparkling freshness of the here-and-now. Here. I’ve got one of my legs, my left one, tucked up underneath me. It’s asking me to move it soon. In front of me is the low table covered with a gold cloth that sits between me and my psychotherapy clients. A dark grey stone Buddha sits on it, hands folded on his lap, lit up by a tea-light in a red lotus flower candle holder, the petals translucent. Now. In ten minutes I have a Skype session with a client in Canada, but right now I am tasting a gingerbread truffle and moving my cold fingers across the keyboard. This is my beginning for this book. 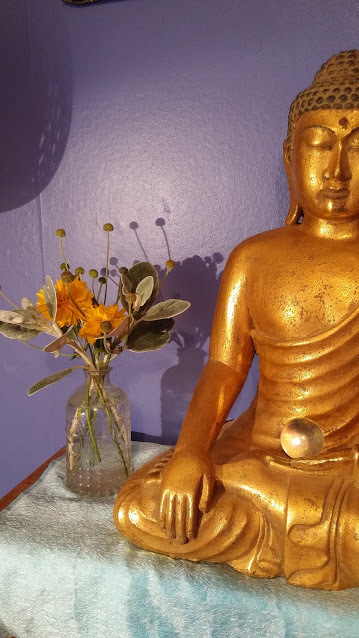 Here in my office with its Buddhas, its powder blue end walls, my books, the view, my cat-scratched rug, my damp red sock draped over the armrest of the chair. What is your beginning? What is you’re here-and-now? The questions at the end of each chapter will give you an opportunity to become properly present. I don’t want you to just swallow my words whole (or spit them straight out) – I’d like you to swish them around in your mouth for a while. I’d like you to stitch yourself into this book. Take as long as you like to find your own answers – I’ll be here when you get back. What can you see, smell, hear, feel and taste? What is happening in your body right now? What do you fear here and now? What do you hope here and now? What do you want here and now? What do you need here and now? What can you offer here and now? This is the first slogan from What Helps: Sixty Slogans to Live By.